Most people assume that embarrassment of working out at the gym is just a body image issue. While that's probably true for some, it's not always the whole story. Embarrassment is one of the top reasons Americans don't work out (along with the lack of time, inability to exercise effectively, and lack of enjoyment of fitness). When I weighed 300 pounds, joining a gym was one of the most difficult (but rewarding) actions I had to take on my personal weight loss journey. 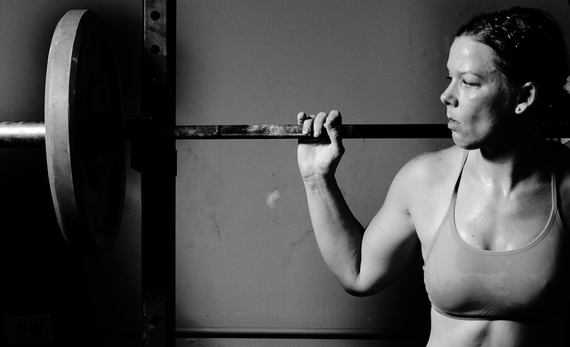 Most people assume that embarrassment of working out at the gym is just a body image issue. While that's probably true for some, it's not always the whole story. Think about it: If all plus-size folks were genuinely afraid of exercising in front of others due to their body size, why do they find it acceptable to go to work every day? Why do they socialize with others? Their body composition doesn't seem to hold them back in many other situations. That also doesn't explain why average-size folks are just as embarrassed to exercise in front of others. It's not always JUST the perceived external judgment of an individual's size that prevents them from joining a gym and getting their sweat on. Do you have the need to look capable at all times? Do you try not to work too hard in front of others (exerting effort, sweating, etc.)? When faced with a setback, do you hide your flaws or avoid the situation entirely? Does it seem pointless to even try? If you resonated with any of these questions, you might be too embarrassed to exercise in front of others due to a perfectionistic, fixed mindset -- not just what you look like in workout clothes. It may not be clear when this mindset originated, but at some point, it became your truth that natural born physical (and mental) ability is far superior to trying (and struggling). We're all exposed to fixed mindset messages on a daily basis. Sometimes, it's a parent praising a child's grades ("You're such a smart girl") or a football coach evaluating a player "Wow, that's what we call natural talent!"). These types of messages deliver unspoken assumptions about the flexibility of skills and may contribute to the beliefs we hold about natural born talent being more valuable than effort and skill developed over time. Over the last few decades, Carol S. Dweck and her colleagues have conducted research in which identifies two distinctive mindsets (the fixed and growth) According to findings, individuals with a fixed mindset believe in natural-born ability (and that's it). Growth mindset individuals believe that their skill can improve through regular practice. The two mindsets lead to vastly different behaviors and substantially influence goals, motivation, achievement and experiences of situations. When folks view their physical ability (or intelligence) as fixed (cannot be improved), they tend to value looking strong and smart above all else. They avoid challenges at all costs because taking the risk of exerting effort in front of others may make them appear unfavorably weak (and unworthy). If the day should come when someone with a fixed mindset decides to workout in front of others, it may not last long if they encounter a setback or if someone (like a personal trainer) draws attention to the fact they aren't performing an exercise correctly. They will also become discouraged when they aren't getting the fitness results immediately. Soon, they will stop going to the gym entirely, blame their inadequacies on others, or lie about what's going on to avoid the shame of not being a natural born gym rat. Some folks are convinced they can lose weight without exercising. And it's true, they can. But it's not a healthy way to live the rest of your life. Some sort of exercise is crucial for good overall health (not just weight loss). Approximately 78.6 million Americans are obese according to the CDC, perhaps partially because 85 percent of Americans do not participate in regular vigorous physical activity. From my experience, fitness helped me shed 150 pounds, increased my self-confidence, improved my overall well-being, and even helped me discover an unexpected passion for running. A study published in the Journal of Health Psychology revealed that regular exercise improved how folks felt about their bodies -- even if they didn't lose weight or gain any visible improvements in their physical appearance. The number one thing that got the ball rolling on my weight loss journey was facing my fear of working out in front of other people. I had to get used to the fact that I would be sweating like crazy and struggling with my physical movement in front of peers. Developing a growth mindset is linked to better performance and determination, especially when we are faced with challenging tasks (like new fitness routines). People who have the growth mindset believe that successful performance is driven by their blood, sweat, and tears. To develop a growth mindset, it's important to explore why we do what we do, develop new ways of thinking and feeling, and switch our perspective to a compassionate mentality. It's not something that can be developed overnight, and requires willingness and practice. Bring your BFF. Going through new and challenging experiences are always easier when you have someone going through it with you. Keep a workout journal. Track your physical progress and emotional intelligence growth. Notice the effort you applied to your workouts and how it made you feel. Note your challenges and all of the possible strategies to overcome them. Mirroring. Find someone in the gym who looks secure in their ability and mirror their physical actions. You don't have to look like a fool if you're copying the proper workout technique from a seasoned gym goer. Be a leader. You're at the gym to inspire others, not to be judged by others. When we see folks who look like us, we feel more comfortable and connected. It's important that we keep showing up to inspire others like us to do the same. If we allow the shame of our bodies or lack of ability to keep us from showing up, it'll do the same for others like us. If you can't do it completely for yourself -- do it for someone like you. Someone needs to see you there trying so they know it's okay to try, too.